A native of South Africa, Mark has been playing polo much of his life and has been teaching for the last 20 years. Growing up in a family of polo players and horse trainers, he played polo competitively in South Africa from an early age. As a 4 Goal professional Mark played worldwide which eventually brought him to the US to play. Mark is also an accomplished horse trainer. He has been training horses for over twenty years. Two of the horses he trained have won Best Playing Pony in the US Open. Now a 3 Goal pro, Mark has worked with Barlee since 1999 to grow the sport of polo in Houston. Barlee transitioned from horse trainer to polo player while working in Jackson, Wyoming. At the Jackson Hole Polo Club she learned the foundation of her polo career. Polo then took her to Palm Springs and eventually to Houston where she began the Polo School in 1990. 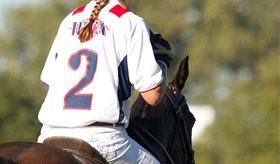 Among her many accomplishments as a rider and polo player, Barlee has played for the US Polo Team in Australia. She also has played in California, Florida, Argentina and England with some of the world’s best polo players including Memo Gracida and Tommy Wayman. For information on fees and times, please contact Tammy Beeson at 713-681-8571 ext. 101 or email playpolo@thehoustonpoloclub.com.